Trump's Foreign Policy Choices: What Role for NATO? Trump’s Foreign Policy Choices: What Role for NATO? Donald Trump’s unexpected victory in the race for the White House caused major apprehension among NATO allies about the future of the alliance and American commitment towards it. Since American geopolitical concerns are shifting from the Atlantic to the Pacific and to China, and Russian military activities have risen quite substantially, Trump’s rhetoric of a renewed American isolationism determined widespread preoccupation among European NATO allies, especially the ones facing the Russian threat. During the presidential campaign, the tycoon presented a clear perspective of reducing American military commitment in the world. In an interview to the New York Times prior the Republican Convention that bestowed the presidential nominee upon Trump, the tycoon pointed out that, under his Presidency, the United States would start negotiations with the allies in order to reconsider the American position in the alliance. Trump asserted at least two reasons for his perspective: first, he said that “at some point, we cannot be the policeman of the world”, and, second, that the countries allied with the US, especially NATO members, must raise their contributions to the common defence. Even if his isolationist rhetoric has toned down during the presidential campaign, the next US President’s change in foreign policy – well resumed in his motto “America first” – provoked a debate inside the US. Madeleine Albright, Secretary of State during Bill Clinton’s presidential mandate, said that national security “cannot be a sum-zero activity”, and that US military commitment in NATO cannot be revised on the basis of other NATO allies’ contributions to the alliance’s military budget. On the other hand, Trump’s position regarding NATO has been confirmed by Carl Paladino, the president-elect’s key ally in the State of New York, who invoked increased contribution from NATO countries, or they will face “consequence”. 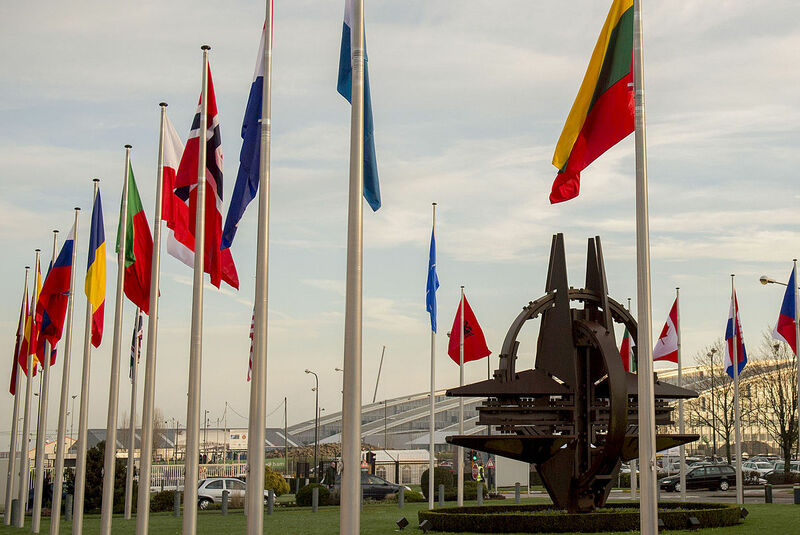 Despite Trump’s declarations regarding NATO as an “obsolete” organization in need of a deep readjustment, NATO’s reactions to the president-elect’s declarations have been conciliatory. In his press release after Trump’s election, NATO secretary-general Jens Stoltenberg hoped for collaboration and joint work between the Atlantic alliance and the White House. Nonetheless, Stoltenberg’s declaration is no more than consistent with the protocol and does not allow us to better understand the state of the relations between the organization and Washington. In fact, in a recent interview Stoltenberg underlined that in the current geopolitical context, “going it alone is not an option, either for Europe or for the United States,” giving the impression that the NATO concern towards the future President of the United States is genuine. Moreover, Trump’s perspective about NATO has found an unexpected supporter in British Secretary of State for foreign affairs Boris Johnson, as the latter shared Trump’s view concerning the need for European countries to spend more on military budget. This assessment has been shared by British Defence Secretary Michael Fallon, who warned NATO countries to pay their “fair share” of the alliance’s foreseen expenditures. NATO’s goal related to the allies’ defence expenditures has been established at 2% of a country’s GDP, and only 5 countries will reach this goal in 2016. Finally, it is difficult to foresee the future of the NATO alliance in this phase of the American administration. On the one hand, it has been said that Trump’s narrative during the presidential campaign was as aggressive as it had plenty of caveats and room for retreat. This ambiguity between electoral narrative and real intentions left room for optimism but it is not clear how far there will be room for negotiation, or if the NATO alliance is due to finish. On the other hand, a lot about this issue will be cleared when the new US Secretary of State is chosen: in a possible shortlist of Secretaries of State are included politicians like Newton Gingrich, who declared that he would not risk a nuclear war “over some place which is the suburbs of Saint Petersburg [i.e., Estonia, a NATO member],” or John Bolton, who said he felt “disturbed” by Trump’s words about not helping a NATO ally if attacked in case it did not keep up with its financial obligations. In this situation, Obama’s first words after the election of Donald Trump have been quite clear: during a trip to Europe, he will tell European leaders that US commitment towards NATO has not weakened, and that the president-elect is committed to NATO. Only Trump’s first acts as President of the US will clarify the future of relations among NATO members.